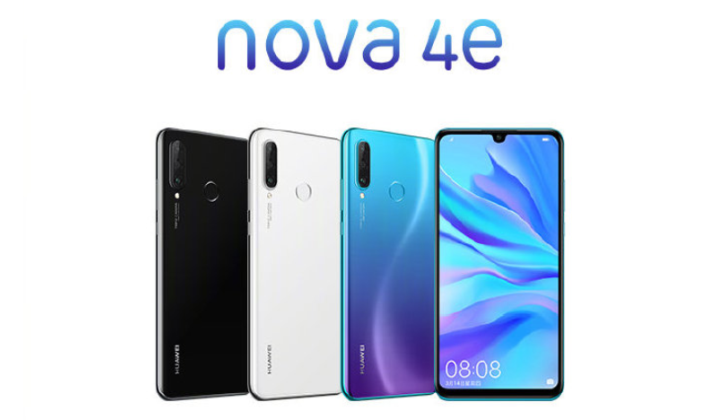 Huawei Nova 4e Goes Official in China; Specifications, Features and Price - Playfuldroid! Huawei Nova 4e is the latest Huawei phone to get announced in China. It is a mid-range phone that has arrived with price tag of 1,199 Yuan ($178) for its starting model. The handset comes with a big display along with impressive front and rear-mounted cameras. The Nova 4e comes with curved 3D glass body on its rear. It is fitted with a 6.15-inch IPS LCD display panel that produces full HD+ resolution and 96 percent screen-to-body ratio. The Kirin 710 powers the 4 GB and 6 GB RAM editions of the smartphone. When it comes to storage, both models are equipped with 128 GB of native storage and a microSD card slot. The rear shell of the phone has a triple camera module with a 24-megapixel main sensor that is coupled with a 120-degree wide-angle lens of 8-megapixel and a 2-megapixel lens for adding blur effect to the images. On the front is a 32-megapixel selfie camera. A fingerprint scanner is available on the back panel of the phone. The Huawei Nova 4e variants such as 4 GB RAM + 128 GB storage and 6 GB RAM + 128 GB storage are respectively priced at 1,199 Yuan ($297) and 2,299 Yuan ($342). The pre-orders of the phone begin from today in the home market. Its sales will begin from March 21.